Shoulda had a salade too…. This post has two basic, staple recipes that come together for a nice home cooked meal. It was neither thought out nor intended to be unique in any way. But there are those times when you make something and you’re like wow, someone needs to try this. 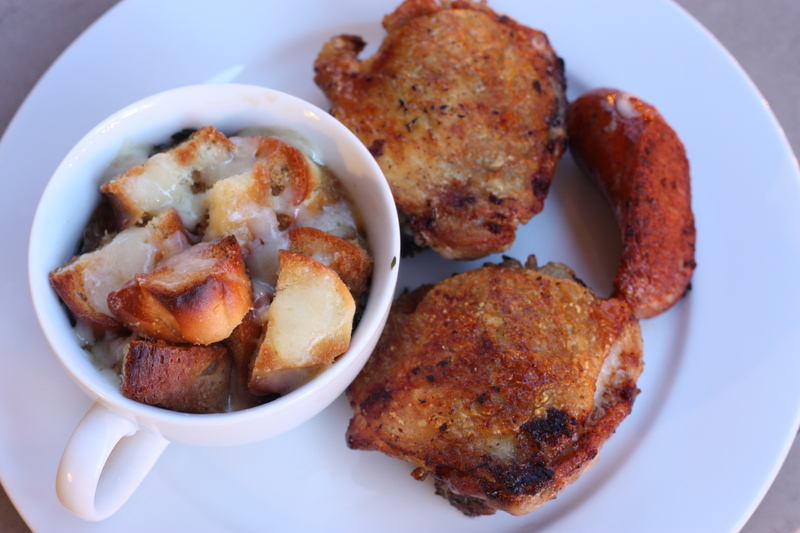 So in one corner we have a French onion soup, with new York white cheddar instead of Gruyere, and in the other corner we have a Crisp Pan fried Garlic Chicken Thigh. Like I said, it’s all simple. Fresh thyme , a lot. Brown the onion in melted butter, in a pan, on medium low heat. This is going to take a while, about 15 to 20 minutes. Add the minced garlic and and thyme. Toss this around to release flavors, and then add the beef broth. Usually I would add some flour to thicken it up before I added the broth but I liked it as is. Besides you can thicken it up with corn starch afterwards if you changed your mind. Bring to a boil, reduce heat, and simmer with a cover. Now for the chicken. If you want crisp skin remember, low heat for a long time! Also when you’re frying something for a long time, pepper it after so it doesn’t burn. First, combine your minced garlic, butter, and herb de province. Season with salt and pepper. Using your hands, take about a tablespoon of the mixture and spread it UNDER the skin of the chicken thighs. Make sure to spread it well. Once this is done for all the thighs, salt the skin to taste. Now in a pan, heat a generous amount of olive oil on medium heat. Place the chicken skin down in the oil. Salt the other side while it’s in the pan. Cook skin side down for about 8 minutes, or until golden and crisp (don’t be scared to flip). Flip the thighs and finish cooking the thighs, removing them to rest afterwards. Simple things are usually the best, and this definitely great, easy to do, and easy to enjoy. Give it a try! This entry was posted on June 8, 2012 by rrfoods in Chicken, Dinner, Lunch, Redmeat and tagged butter, chicken, dark meat, Dinner, french, garlic, herb de province, lunch, onion, soup, thigh, thyme.